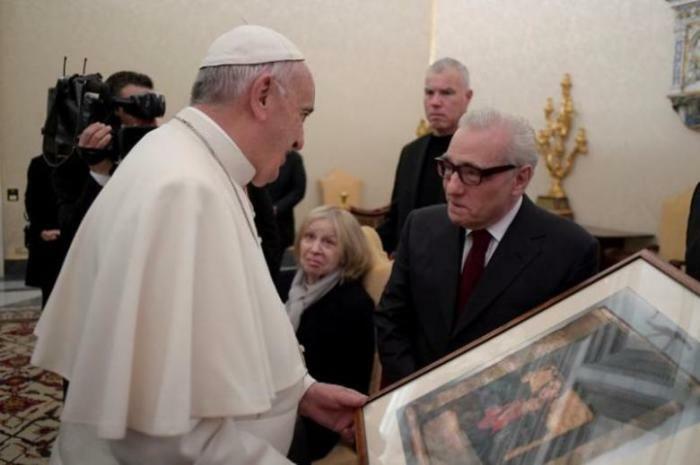 Film director Martin Scorsese met with Pope Francis at the Vatican last week where he screened his upcoming film "Silence," and spoke about the experience of seeing his movie played near a giant crucifix in the chapel. "So the whole film played on this crucifix, it was quite stunning," Scorsese said, according to USA Today. "It was quite an experience." "Silence" focuses on the story of two Jesuit priests, played by actors Andrew Garfield and Adam Driver, facing intense danger and persecution while on a mission in 17<sup>th century Japan. As Reuters reports, the Jesuits are tasked with finding their missing mentor, and encounter great hardships in Japan, at which time period Christianity was banned. "There the missionaries face a choice: they can save themselves and Japanese converts from death by crucifixion, burning and drowning if they trample an image of Jesus known as the 'fumie' to show they renounced their religion," the plot description reads. Scorsese said Francis was very "disarming" at their meeting last week, and put everyone at ease. "He was the most disarming ... everything was fine," the film director said. "He was smiling and thanked us for being there." The pontiff told Scorsese that he had read the novel that the film is based on, written by the late Japanese writer Shusaku Endo, who converted to Catholicism. "(Pope Francis) did say, I hope the story of the film, knowing the book, bears much fruit," Scorsese added. The Rev. James J. Martin, who worked as a consultant to the film in various capacities, has said that "Silence" guides the viewer as if "living in a prayer." Martin stayed after the film's screening at the Vatican to answer questions, and said that Scorsese displayed a deep faith. "He was very engaged and energetic and really impressed the Jesuits in the audience with the depth of his spirituality," Martin said. "You could not make a spiritual film like that without being a spiritual person. It would come off as empty," he added. Scorsese, whose other famous films include "Taxi Driver," "Raging Bull," "Gangs of New York," and "The Departed," stirred controversy in the Catholic community with his 1988 film "The Last Temptation of Christ," because of the depiction of a dream in the plot where Jesus marries and has a family, but later regrets His decision and turns back to God's plan. The film was protested by some conservative church leaders, even leading to a cinema in Paris where the movie was playing being fire-bombed, though other Catholics defended the film. "Silence" opens in theaters nationwide on Christmas Day.